Brand new, Beautiful, and perfect condition. As we travel across the country we are always looking for places exactly like this, but rarely find anything close. I love this place and will be back. Thanks to all at Wanderlust Crossings. Great new facility with nice, long, concrete spaces. Multiple dog parks. There was mention of a dog wash but we didn’t try it. Newtly groomed facility with firepits and manynwater features. Lots of room for dog walks. Don’t miss the Thomas Stafford air and space museum at the local airport, about 10minutes away!! Great museum with no crowds. My wife and I stayed here both on the way to California from Arkansas and on the way home and we really enjoyed the campground. Super level pull throughs and the staff were all really nice and helpful. Fire pits and picnic benches available in all spots as well. We stayed here for two days in our 41' fifth wheel and wish we stayed longer. Checked in was easy and the young lady checking us in was helpful with getting our propane tanks filled on site. This park has all large cement pads and a great fenced in dog area. We did not use the restrooms or laundry room, the park was very clean and everyone was very nice. We were thoroughly impressed by this park. The site pads are concrete, wide enough for your rig and your lawn chairs. The landscaping, though new, is beautiful. Once the trees mature, there will be sufficient shade on all sites. The lawn areas are lush and thick with edged lines along concrete throughout the facility The roads are all paved. The pull thru site was concrete, level and long. Check in was easy. The only thing lacking was a pool or hot tub a splash pad is planned so that will help everyone cool off on those hot days. We definitely plan on returning here again. This is an excellent on the road stop. We stayed on our way east and plan to stay there again as we head back west. Very friendly staff, clean, and easy pull through sites. Highly recommend this park. I didn't rate the restrooms only because we didn't use them, but this is a new park so I am sure they are fabulous. A beautiful park, very well maintained, great owners - very friendly. A great place to stay! This place is IMMACULATE!!!! Sites are HUGE. Lots of grass. The only thing missing is a swimming pool. Spent one night here in late April 2018. Was planning to spend a couple days but the wind was so strong and the weather for the next day wasn't any better, we left after the first night. The park is very new. Check in was easy and staff was informative. The sites were nice but there was no shade on the majority of the sites. It looks like most of the long-term campers have the only shade available. We didn't use the restrooms or shower house but the outside of the building is new. Maybe after their trees mature, will be a little nicer. Park just opened in June 2017, so everything is new. Definitely bi-rig friendly. We had FHU with 30-amp. Site was plenty big enough for our 25' class C with towed car. We met the friendly owners while we were out walking our dog and talked with them a while. They have a big rig and live on site. They shared their experiences of trying to find big-rig friendly parks thru their years of travels and decided that when they opened a campground that they would do everything, first class. It really shows in the details and the park is beautifully landscaped. Location is far enough from I-40 that we didn't hear any noise from it. This was the nicest campground that we stayed at on our way from Nashville to Las Vegas. Definitely would stay here again. $36.00 for one night with Good Sam discount. WHAT A WONDERFUL CAMPGROUND!!! After driving too many miles past all the junk belonging to the morally bankrupt oil industry along I-40 west from Oklahoma City, Wonderlust was a complete surprise...of the good kind. The owners did things right. I’ve stayed in precious few RV parks that look like an architect designed them; this one did. And when the owners had Havanese dogs...with puppies...that was the icing on the cake and cause for my little Neezer to celebrate! If I could give this park six stars, I would. We’ll be sure to stop on our way back east form CA. Wind chill below freezing. Wind chill below freezing...way too cold for us FL rejects. But our warm welcome was wonderful. This is one of the best campgrounds that we have stayed at. From the phone call to reserve a spot, to arriving at the front door, the staff is very friendly. This is a very clean park. If you have a dog, they have a fenced area for them. Nice play area for the kids. Would definitely say here again. Hello 21 st century. Confirmation email by text with a copy of campground map showing exactly my site. Email receipts. Park is beautiful. I think it is only a year old. Concrete pads with full hook ups. Right off the interstate but I did not hear the traffic. The owners were so nice. Propane available and they helped me with one of my tanks. Definitely on my stay at again map. This place rocks. We love you all. See you next time we go west. I give you a 6 star and an eleven. We spent one night at Wanderlust on our way thru OK. Found the campground to be very nice. It just opened in May 2017. All sites are nice concrete pads, with all hook-ups, including cable. However, you can get like 30 channels over the air from OKC. The staff was excellent. I went up to office to watch a football game on their BIG(80") TV. Manager was very nice in helping getting the right channel(Direct TV). Lounge area also has a pool table and some video games. Only thing missing for now is a swimming pool....perhaps it is in the works. Will certainly stay there again !!! 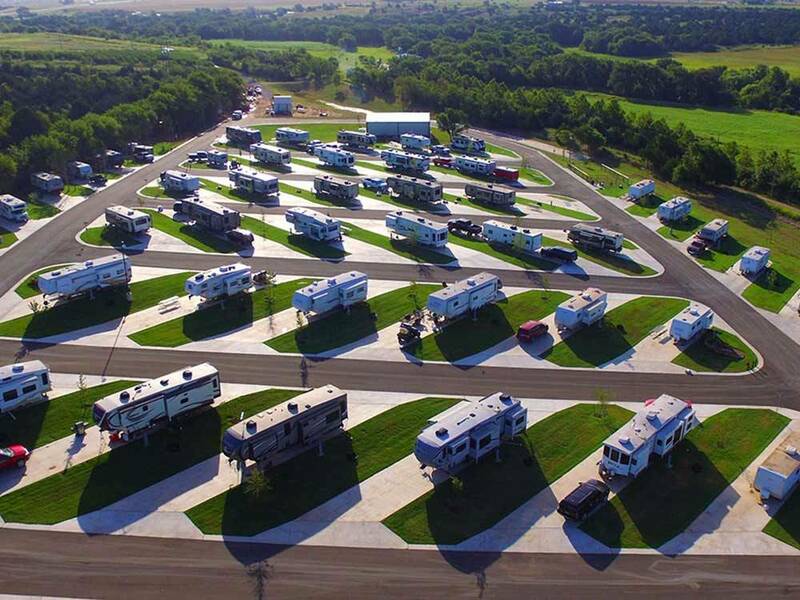 Brand new RV park that just opened this month. It is gorgeous, with state-of-the-art facilities and wi-fi that actually works. It is a family-owned venture that will only get better as the park matures. We are on our second coast-to-coast roadtrip in two years, and this is certainly in the top 5% of facilities we have visited. Will definitely stay here next time we are in the area.